And if somehow the sheer mass slips you by, the enormous kidney grille up front means you will stand out among the procession of Suvs jostling to reach the school gate or corporate car park. The muscular front bonnet along with the 21-inch wheels give it a menacing exterior presence, while the roof rails and the sweeping chrome trim-strips hint at a go-anywhere capability. Inside, the dashboard is beautifully uncluttered, and the X7 boasts the latest digital light cockpit, first introduced on the X5, that includes a fully digital instrument cluster. The variety of materials and textures exude quality and you are cosseted in pure luxury. But there are still a host of premium packs that you can add, including one that offers massage-seat functions. At the launch, BMW was understandably keen to point out the differences between this X7 and the smaller and, crucially, cheaper X5. In terms of size, it is 26mm longer and 63mm wider. The extra space makes the most difference to rear passengers, there are three rows of seats all with decent legroom, and even the third row has two full-size seats with space between them. BMW also has a six-seat configuration not offered by any competitors. Boot space is a generous 326 litres and increases to a maximum 2,120 litres when the backrests of the seats in the second and third rows are folded down. There is also a two-section split tailgate that opens and closes automatically and hands-free. There are three different engines on offer, one petrol and two diesels, ranging from the family-friendly xDrive30d to the M50d M Performance model - a sublime blend of power and economy. On the road it is effortless, and wafts you along smoothly. Despite its size, it is impressively dynamic but at all times supremely comfortable. It's also simple to park, thanks to the numerous driving aids on tap, reassuringly given its size, the parallel parking aid will squeeze you in so tightly to a parking space you will wonder how to get out of it. It's also crammed with safety aids and standard features including a collision and pedestrian warning with city braking which can alert the driver when a cyclist is detected. All this indulgence does not come cheap, and the starting price for the X7 xDrive30d is €113,000, rising to €120,890 for the xDrive40i, and the range-topping M50d will set you back €137,300. 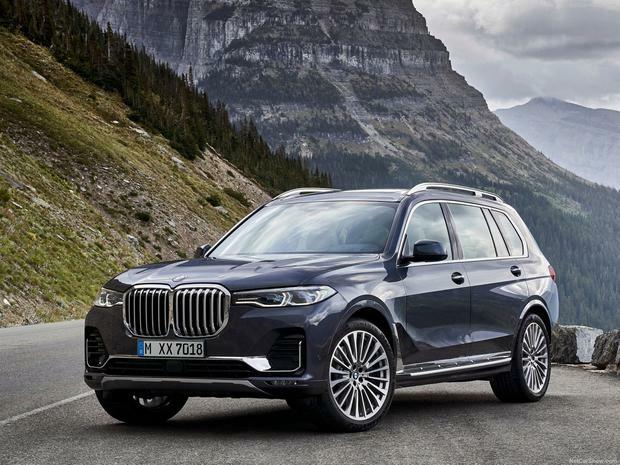 The BMW X7 excels at being a large, comfortable and refined car that can cosset seven in pure luxury. Yet while there is much to sing about, it's a struggle to understand why someone will buy one over the X5, a car that offers similar performance and economy for €25,000 less. Behind the wheel, it looks virtually identical and on the road, the two are inseparable, so while it is certainly bigger than the X5, I'm not convinced it is any better.